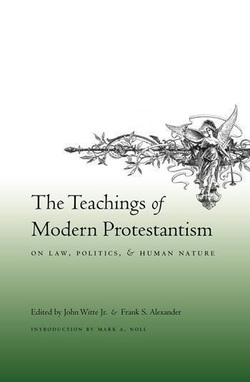 Book: The Teachings of Modern Protestantism on Law, Politics, and Human Nature - John Witte, Jr. The Teachings of Modern Protestantism on Law, Politics, and Human Nature examines how modern Protestant thinkers have answered the most pressing political, legal, and ethical questions of our time. It discusses the enduring teachings of important Protestant intellectuals of the late nineteenth and twentieth centuries. Leading contemporary scholars analyze these thinkers' views on the nature and purpose of law and authority, the limits of rule and obedience, the care of the needy and innocent, the ethics of war and violence, and the separation of church and state, among other themes. A diverse and powerful portrait of Protestant legal and political thought, this volume underscores the various ways Protestant intellectuals have shaped modern debates over the family, the state, religion, and society. The book focuses on the work of Abraham Kuyper (1827-1920); Susan B. Anthony (1820-1906); Karl Barth (1886-1968); Dietrich Bonhoeffer (1906-1945); Reinhold Niebuhr (1892-1971); Martin Luther King Jr. (1929-1968); William Stringfellow (1928-1985); and John Howard Yoder (1927-1997).